The trio of curmudgeonly, middle-aged men continue to pull in vast audiences that are the envy of the broadcasting industry. Now they are firing up the engine for the third season of The Grand Tour, and have recently announced that there will be at least two more seasons of the hit streaming show, proving that it is firing on all cylinders. Here are some of the highlights of what fans can expect from those most mischief-making men and their motoring machines. They called it Motor City but Detroit is a shadow of its former self, littered with failed car factories and the buildings that once belonged to proud suppliers. Entire neighbourhoods have been laid to waste, and the only signs of a growth industry are organic street food stores or art galleries for the hipsters that have moved in. And frankly, Clarkson, May and Hammond are unhappy about it. To help with plans to rejuvenate the city, the three amigos turn it into a giant playground for drivers. Their toys include a tuned Ford Mustang, Hennessey Exorcist Camaro and Dodge Challenger SRT Demon. Along the way, Bon Jovi makes an appearance. What better way to test the capabilities of three cheap and cheerful, second-hand 4x4s that taking them on a trip to photograph some birds and butterflies? Hang on a moment, you’re thinking, what’s so testing about that? When the environment just happens to be the jungle of deepest, darkest Columbia, you realise that the Fiat Panda 4x4, Jeep Wrangler and Chevrolet Silverado aren’t going to have an easy time of it. Nor, for that matter, will Clarkson, May and Hammond. How will three pick-up trucks and three men with greying hair and expanding waistlines survive being dropped into a lawless environment that might just resemble the post-Brexit apocalyptic land that Britain becomes? That’s what our three fearless investigative reporters are determined to find out, as they are challenged to survive in just such an environment, in a Ford Ranger, Mercedes X-Class and Volkswagen Amarok. Any driver that appreciates classic cars and keeps an eye on their prices can’t help but have noticed that the majority have shot up in value faster than a piece of one-off Banksy artwork that’s been put through a shredder. To help car enthusiasts quench their thirst for a classic of their own at a budget that won’t require them to sell their house, mother and grandmother, Clarkson May and Hammond buy an Alfa Romeo GTV6, Fiat X1/9 and Lancia Gamma coupé and drive them to north Scotland, where some of the most incredible roads await. Will the cars be up to it, though? An Aston Martin DBS, Bentley Continental GT and BMW 8 Series on a drive of a lifetime across the Caucasus mountain range. And they get paid to do this stuff? 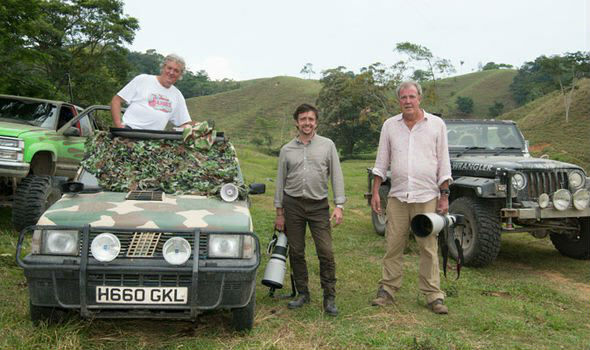 Clarkson, Hammond and may have spent most of their working lives messing about with cars. But can the three of them actually build one themselves? We’ll get to find out, as the three gearheads are dropped in the wilderness of Mongolia and told that their only way out is to assemble a flat-pack car.